Trail Mayor Mike Martin greeted Transport Minister Todd Stone with a handshake on Tuesday. The minister was in town to make a big announcement - Trail was granted $1.18 million from the BC Air Access program for improvements at the city-owned airport. Trail receives $1.18 million from the BC Air Access program for a new terminal at the city-owned airport. Jun. 21, 2016 3:00 p.m.
Plans for a new terminal building at Trail Regional Airport will roll out sooner than expected after the city was granted $1.18 million from the province this week. 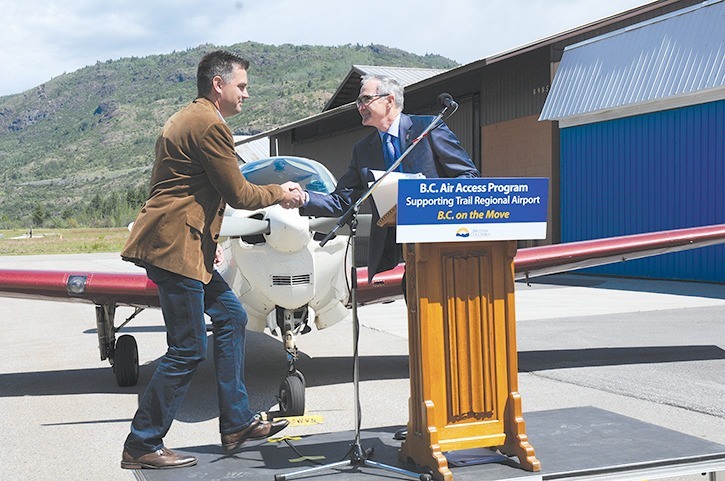 Todd Stone, Minister of Transportation and Infrastructure, made the million-dollar announcement at the Trail airport on Tuesday, noting the BC Air Access funding is the single largest investment from the program to date. Besides providing passenger and cargo air service, the city’s airstrip is a primary access point for vital services such as BC Air Ambulance and the Ministry of Forests, began Stone. “This is an important airport for the community and the entire region,” he said. “When we look at the existing facility, I walked in with Mike (Trail Mayor Mike Martin) and said I would need to tour the facility,” Stone explained to a chuckling audience. The current terminal is 70-plus years old, so an upgrade and expansion is long overdue, Stone added.